There are neurotypical mindsets and those that are not. In the USA (may be wider, sorry not known to me) this is reckoned to relate to 1 in 55 who may be non-neurotypical or assessed as on the autism spectrum. That is; synapse connections are not within a norm. The variation in synapse connections can be massive so the degree/range of ability is huge. There are specific clues that help to recognise the condition but of course, there are hugely differing degrees. The scientific understanding of autism is growing slowly but in the last few years there has been remarkable progress in understanding the problems and the development of various techniques in improving and overcoming difficulties. Small steps are leading to big changes in outcome. Progress has been made but this is not about the research or the developing methods of helping those who educate (from the smallest to widest sense). This is a review of a best-selling book by Naoki Higashida, a young man, thirteen when he wrote it, first published in Japan in 2007. His ability to communicate in speech was severely limited. Conversation was a major hazard and when the nerves went, so would the words. There is an Introduction by author David Mitchell eloquently setting a scene that many a parent or carer/teacher will recognise around their autistic charge and explaining how this book came to be translated and published. An alphabet grid, a home-made qwerty board, a mother determination and now a computer keyboard freed Naoki fom a serious inability to communicate and eventually enabled him to share his world. Since this book he has continued writing and has been published again. The short Preface by Naoki sets the scene and you are off on the series of 57 brief questions to which he gives his answers. Always revealing and balanced with a perception that belies his age of thirteen. There is always an awareness of the difficulties of the personal (mind and body) world he lives in and it’s relationship to the world that the majority live in. Families and carers may recognise some questions as theirs and others they may feel safe in knowing the answers to but throughout and from each they will receive another small piece in a jigsaw, or a window will be opened a little more by the answer. Interestingly, autistic people see/relate to specifics of something and then generalise whilst neurotypical see generality first then focus down to specifics. Illustrating how different their view of the world starts with and then may falter at almost any point towards the general end of the scale. The opposite of a neurotypical person who sees the general and narrows down to specifics. There is a final, beautifully written short story and very brief Afterword. Part-sample: — Q25: What’s the reason you jump? ‘But…………’. Followed by a two sentence paragraph that may sums up a weight of emotion. I could pick out little quotes but it would not display the style and content, a cross between simple matter of fact and fascinating description. The book moves along from question to answer and gradually fills out the actions and foibles of autism with high degrees of explanation. (with the caveat that no two people will be exactly the same though generalities are very likely). This is a personal as well as sympathetic to others, account of his world, feelings and struggles. Above all we see the strengths of this young man and his determination to succeed. This is a short book, covering some of the general issues we may come across in an imaginative fashion. An impression of continuous struggle with the day to day difficulties of managing autism. Naoki gives the lie to autism being an inability of emotion, rather it is the struggle to contain oneself, where emotion may kick in at any time through a flashing memory connection (‘meltdown’) or perhaps the distraction of sight and sound clashing with the inner struggle to communicate and control mind and body. That inner struggle is a tiring, all consuming activity that deserves our support and patience. There are now many books on autism and Aspergers aimed at helping parents and families, carers and teachers in practical and educational matters as well as research and schemes. Some by parents or family, it is good to find one of the few books by one who has the condition. Any sympathetic reader would do well to read this book and any less-than -sympathetic really ought to. 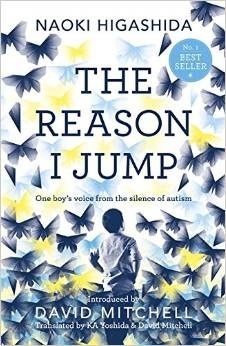 Similar to ‘Reason I jump’ but more and wider range questions with longer answers by an Aspergers author and YouTuber, also a public speaker: Alex Olinkiewicz : In My Mind with DrRichard O’Connell writing Alex’s answers ‘verbatim’ for the book. Published in USA 2014. This author was older than Naoki when the book was written.